Welcome to the Sunny Side, and thanks for visiting us! Visit us on Facebook to get additional updates through the year. 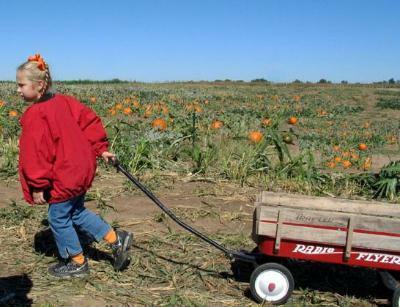 We are now open every day from 11AM to 7:30PM through Oct. 31.
pumpkin patch in a rural farm setting. right off of the vine it grew on! your pumpkin from a box!" Grant & Charisse Nurnberg personally welcome each and every family and group to our family farm. We have planted 8 acres of pumpkins so we should have enough varieties and great selections for all of our visitors through the entire month of October! Our pumpkin pricing is similar to area stores, with a much better and fun pick-your-own selection! Note our daily hours of 11AM until 7:30PM, from September 29 through October 31. Bathrooms, snacks and small gifts are available in our South red barn. We serve steamed hot dogs, nachos, chips, popcorn, candy bars, pop, hot chocolate, cider and coffee. Here is a drone photo of our 2018 farm and the butterfly and pumpkin mazes. The night maze is only available to groups by reservation. We provide lighting for all of our normal daytime activities including the pettting zoo, the Sunny Side Slides, and all of our playground activities (the horse drawn hayrack ride runs on weekends only from noon to 6). There is no extra charge to reserve an area for your group. Other than the chance of some widely scattered sprinkles, the end of the month looks nice with highs in 60s to 70 through October 31. Come on out and get your last minute pumpkins! At Sunny Side Pumpkin Patch we make a commitment not only to our customers, but to our community as well. We have contributed to the following organizations: The Salina Emergency Food Bank, 4-H groups, McPherson County Food Bank, Salina Rescue Mission, Salina Area United Way, CAPS, DVACKS, Ashby House, Salvation Army, Boy Scouts, and Big Brothers & Big Sisters. Gourds for food program: In an effort to promote food donations, please bring non-perishable food items and receive a free mini pumpkin or gourd for each item. We will distribute the donations to local food banks, we collected around 800 food items last year, we thank everyone for the generous donations to the community!